The ViVitro Production Tester Quality Control System provides a simplified system to assess valve performance criteria for production quality control. The ProductionTester assesses pressure and flow criteria while recording high speed valve footage via an integrated camera. Consisting of a digital camera, quick change cartridge, and QCTest software, the Production Tester is an add-on to the ViVitro Pulse Duplicator and is intended for Production / QC applications. The Production Tester quickly captures reliable results for a fraction of the cost of designing an in-house system. 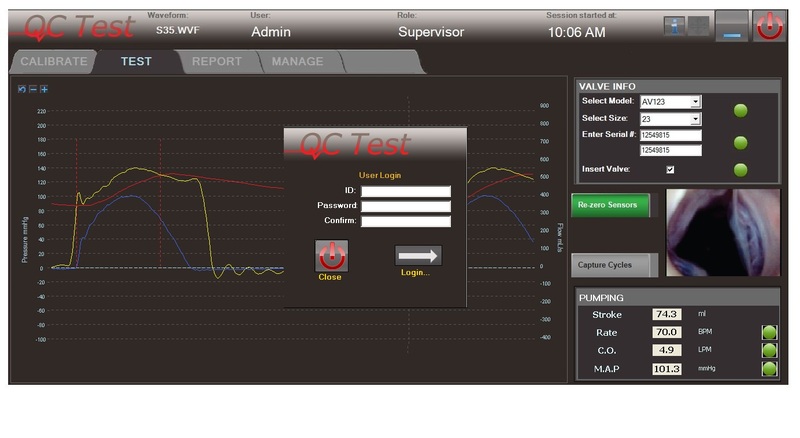 QCTest software is the only turnkey validated function test software system on the market. The software is easy to use and operates through a USB Multifunction Measurement and Control Board, compatible with 64-bit operating systems. A quality control tool for QC heart valve function testing, the ViVitro Production Tester measures valve performance in accordance with regulatory requirements. QCTest software includes security, risk management, simplified user interface, error checking, control steps and standard disposition outputs. Developed by ViVitro the software meets validation requirements outlined in the FDA General Principles of Software Validation; Final Guidance for Industry, document. Contact us to learn more about the Production Tester Quality Control System and how ViVitro engineering staff can help you meet your Quality Control needs. Request your copy of the QCTest User Manual (25985-X2) Revised June 2017. Please provide your name, company name and email address. You will receive a download link via the email link provided.